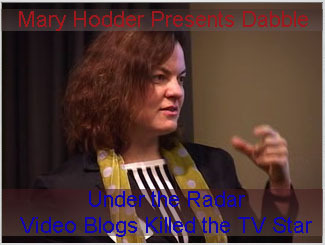 Mary Hodder's presentation of Dabble at the IBDNetwork's Under the Radar: Video Blogs Killed the TV Star event. Om Malik recently blogged on Dabble and Tom Raftery interviewed Mary on his podcast. Apologizes for the high exposure at the start. Thanks for sharing this. If I was in San Francisco I would have gone to this, but you’ve allowed to me to viretually attend! I just featured you on the current episode of Vlog Soup. Thanks! Look forward to seeing the episode and the resultant hits.